TWO industry captains and seven property developments won the coveted “Oscars of the real estate industry” at the FIABCI Malaysia Property Award. Held at One World Hotel in Petaling Jaya, it was the 26th edition of the award presentation and gala dinner event. LBS Bina Group Bhd managing director Tan Sri Lim Hock San, who was named the Property Man, said he felt very happy and proud to receive the prestigious award. This was his first time receiving a FIABCI accolade. The award, he said, would motivate him further to build more affordable houses. “We will offer houses priced RM350,000 next year, in accordance with the Government’s urging to build more affordable houses for the rakyat. “I believe our success stems from our core values – integrity, efficiency, accountability and family. Whatever we get from society, we will give back to society,“ said Lim. who received the Property CEO award, said he felt humbled, honoured and surprised to be a recipient. “It will inspire me to continue the legacy. “We want to continue our tagline to be Malaysia’s landmark builder,” Tee said. The company, he stated, was also the main contractor for the klia2 project and the third developer who revived the 16-year abandoned Main Place residential and commercial building in Subang Jaya. Tee said it was “very important to get things to happen” while holding on to the value of integrity. The seven other projects that received awards this year are: Caffe Diem @ Pekan Cina by Encomas Sdn Bhd in the Heritage (Restoration/Conservation) category while I-Park @ Indahpura by AME Development Sdn Bhd was awarded in the Industrial category. The Master Plan category was awarded to Desa ParkCity which was developed by Perdana ParkCity Sdn Bhd. In the Office category, Bangunan Ibu Pejabat Perbadanan Kemajuan Negeri Selangor (PKNS) by PKNS was the recipient. Setia SPICE by S P Setia Bhd was awarded for the Purpose-Built category with The Greens by Bellworth Developments Sdn Bhd awarded in the Residential (High Rise) category. Lastly, the Retail category award went to Sunway Velocity Mall Sdn Bhd’s mall, Sunway Velocity. Newly-elected FIABCI Malaysian chapter president Michael Geh said the award was the perfect platform to showcase the industry’s creative and innovative projects. 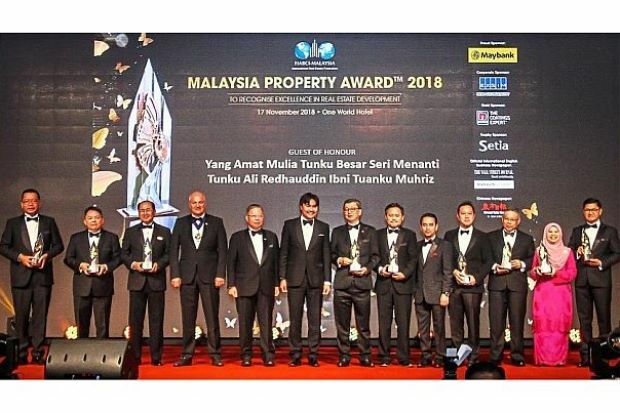 “The Malaysia Property Award is the hallmark of excellence any developers worth its salt would aspire to as it embodies the highest accolade and standards of professionalism in the property and real estate industry. “Over the years, the overall quality of property developments in the country is a testament to the lofty efforts by FIABCI Malaysia to raise the bar in design, quality and sustainability in the real estate and property industry,” he said. Geh said the award’s organising committee members were always refining the assessment criteria to keep up with changes in the field. “I am glad to see that several developers have even set the award’s assessment criteria as their performance benchmark. “I wish to see more entries in the Affordable Housing category as it challenges the ingenuity of developers on how best to innovate to meet the expectations of housebuyers of a modern lifestyle while keeping cost low and prices affordable,” he said. He also said small-sized developers should not be disheartened from taking part in the competition because of their size. “What matters is the overall quality of the projects and you do not need to have a strong or robust company profile. All you need is a good project that you think can qualify to win the award,” he added. “I look forward to learning of tonight’s awarded projects, which will move on to compete at the international level in FIABCI’s 2019 Prix d’Excellence programme,” he said. Makedonov said the international competition would recognise Gold and Silver winners in 16 categories based on submissions from nearly 20 national awards programmes, where winners would be honoured during FIABCI’s 70th World Congress in Moscow next May. The FIABCI Malaysia Property Award 2018 event was graced by Negri Sembilan royalty, Tunku Besar Seri Menanti Tunku Ali Redhauddin Tuanku Muhriz, who presented the awards to the winners.